The Welsh Rugby Union has finally announced a five-year deal with its four regions, ending the civil war that threatened to engulf the game in Wales. It gives the regions a basic £6m a year between them, an increase of £2.4m, with extra funding from competitions. It also ends the player-release row that had threatened November's Wales v New Zealand game in Cardiff. A High Court hearing over the player-release row was due to take place on Wednesday, but has been called off. WRU chief executive Roger Lewis described the agreement as "an historic landmark for Welsh rugby [which] will shape the future of our national game". The dispute which could have ended up in court centred on the Wales-New Zealand game being held on on 7 November - a date which is outside the International Rugby Board Test window. Originally Regional Rugby Wales (RRW), which represents the four regions, said they were not obliged to release players to prepare for and play in the game because it is to take place outside that window. But the two sides have now agreed agreed on this, and other key issues, such as who runs the sport and how many non-Welsh-qualified players should play for each region. The deal includes a commitment by the regions to include an average of 17 Welsh-qualified players in their match squads, increasing to 19 over the five-year term of the deal, and to reduce non-Welsh qualified players to six in each regional squad. International squad players will be released for Wales training 13 days ahead of the first game of any Test match series. The regions will release two players each to the Wales Sevens squad and take control from the WRU of the academies, which develop elite young players, already established in their regions. Each region will also run development squads which will play six games per season. And they will see a boost to their funding. In addition to the core payments from the WRU, they will also receive money from competitions, bringing the total up to a maximum of £14.5m between them per season. 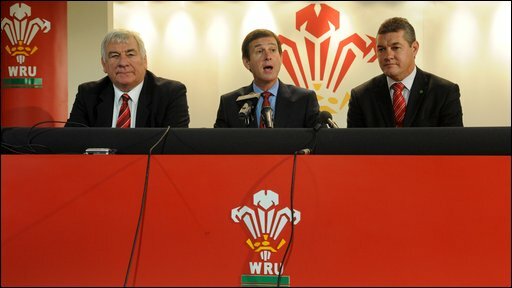 WRU chief executive Roger Lewis and RRW boss Stuart Gallacher brokered the deal, ending two years of talks. Lewis said: "At its heart it [the deal] gives the regions the financial security to carry out a mandate to recruit and develop Welsh international players. "We have achieved an agreement which is rooted in the best interests of the whole of Welsh rugby because a winning Wales will deliver the support and commercial success we need to sustain rugby at all levels across our nation." He added: "The WRU now has to achieve its financial goals so that the game at large can prosper and the four regions will deliver a range of initiatives which develop Welsh rugby talent." Gallacher said: "I believe this agreement delivers to the WRU what it has wanted to achieve for a very long time in that it guarantees the release of Welsh players to pull on the international jersey. "What we now have is a very clear contract which delivers what we all need and I am absolutely certain that all four regions will honour the commitments we have agreed. "This will deliver a vital financial boost to the regions and ensure there is a true focus on doing our level best to keep Welsh-qualified players in Wales. "In the past we have never been able to attain 17 Welsh-qualified players in each match squad but this agreement gives us the potential ability and rewards to achieve that." WRU chairman and ex-Wales captain David Pickering said: "This agreement has been achieved through a meeting of minds across business and rugby expertise, and has therefore required a profound level of understanding and intelligent debate."